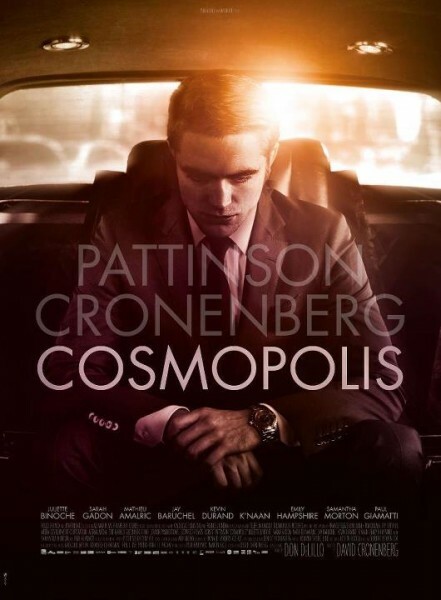 The Sublime, The Sexual & The Violent, David Cronenberg's First Trailer & Poster for 'COSMOPOLIS'! A teaser trailer for David Cronenberg's Cosmopolis has emerged online. The movie based on Don DeLillo's novel, stars Robert Pattinson, Juliette Binoche, Sarah Gadon, Mathieu Amalric, Jay Baruchel, Kevin Durand, K'naan, Emily Hampshire, Samantha Morton & Paul Giamatti. In Cosmopolis, Pattinson portrays a newlywed billionaire who ends up losing his bride & his billions in a single day. The teaser, while short hits home hard in its delivery of the sublime, the sexual & the violent. Hit the jump for the details. Synopsis: "New York City, not-too-distant-future: Eric Packer, a 28 year-old finance golden boy dreaming of living in a civilization ahead of this one, watches a dark shadow cast over the firmament of the Wall Street galaxy, of which he is the uncontested king. As he is chauffeured across midtown Manhattan to get a haircut at his father's old barber, his anxious eyes are glued to the yuan's exchange rate: it is mounting against all expectations, destroying Eric's bet against it. Eric Packer is losing his empire with every tick of the clock. Meanwhile, an eruption of wild activity unfolds in the city's streets. Petrified as the threats of the real world infringe upon his cloud of virtual convictions, his paranoia intensifies during the course of his 24-hour cross-town odyssey. Packer starts to piece together clues that lead him to a most terrifying secret: his imminent assassination." I'm reading: The Sublime, The Sexual & The Violent, David Cronenberg's First Trailer & Poster for 'COSMOPOLIS'!Tweet this!